Run, walk, bike or hike 9 miles on July 22nd to honor the sacrifice and memory of LtCol Mario “Sugar Bear” Carazo. MCAF has partnered with the Sugar Bear Foundation to help raise awareness of gold star/surviving spouses and children of fallen United States military personnel, continuing Mario’s legacy of service. The first 300 participants to complete the event will receive an exclusive race pin with the image above. The registration fee is $25. 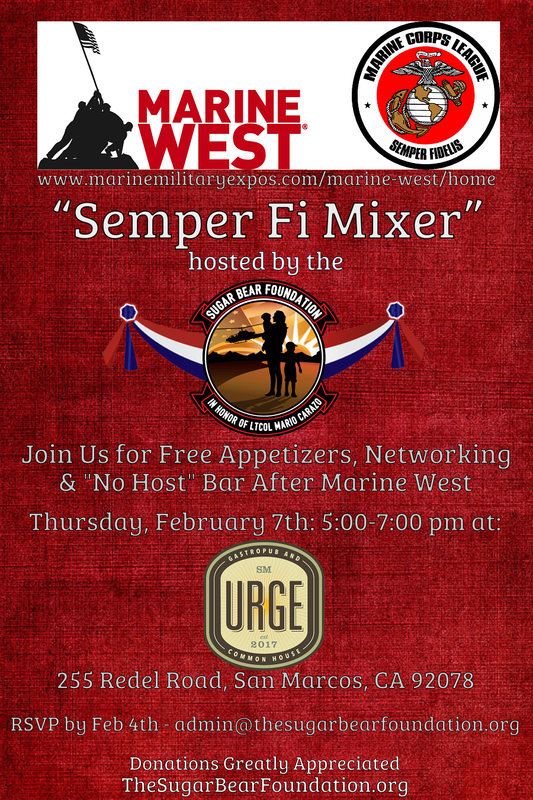 All proceeds support the Sugar Bear Foundation and MCAF's programs for Marines! For those in the San Diego area that register for either the series or the Sugar Bear Run, we invite you to join us at Urge Gastropub & Common House on Saturday, July 27th from 7:00-9:00 pm for free appetizers and a no-host bar. Simply forward your registration to admin@theSugarBearFoundation.org to get added to the guest list. To Track Your Mileage: You can record your miles on your phone with the Map My Run mobile app. Download the Map My Run mobile app and add "MarineCorps Association" as your friend (note: there is no space between Marine and Corps). We will add you to the event you registered for so you can track your progress and the progress of other runners. Please also note that this step is NOT a requirement for this virtual challenge. This is a virtual challenge where you can run, walk, bike or hike any time, anywhere to complete the mileage on July 22. Use #EveryClimeandPlaceChallenge on social media! Join us, along with our friends from the Marine Corps Association Foundation, as we celebrate Mario's life while we raise funds for Marines, surviving spouses, and children. You can run, walk, bike or hike! We know Sugar Bear would be honored and happy that we are celebrating his life in a way that is truly impactful. 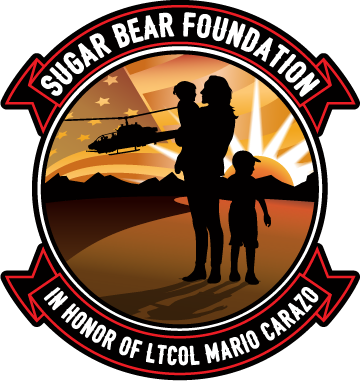 The Sugar Bear Foundation was formed in honor of Lieutenant Colonel Mario “Sugar Bear” Carazo. Sugar Bear made the ultimate sacrifice July 22, 2010, when his AH-1W Super Cobra was shot down while conducting combat operations in Afghanistan. The mission of the foundation is to support the surviving spouses and children of fallen United States military personnel by providing assistance to support programs which meet their immediate and ongoing needs and foster their personal, emotional, and social well-being. We do so in a variety of ways, such as our scholarship, special events and with a grant and internship program (that we are hoping to launch in the coming months) to name a few. Sugar Bear’s Barbeque & Beers - Supporting "Angels of America’s Fallen"
We are thrilled to announce "Sugar Bear’s Barbeque & Beers - Supporting Angels of America’s Fallen" Sunday, January 28, 2018, at Green Flash Brewing Co. (http://www.greenflashbrew.com) - 6550 Mira Mesa Blvd., San Diego, CA 92121 from 1:00 - 5:00 PM. We hope you can Join Us! Join us Sunday, December 3rd from 1:00 - 5:00 PM at SpecHops Brewing Company (1280 Activity Dr, Vista, CA 92081) for Sugar Bear’s Brats and Brews! Help us raise funds for the Navy-Marine Corps Relief Society (educational funding for Gold Star wives/children). Join us Sunday, August 20th at Green Flash Brewing Company from 1:00 pm -5:00 pm as we raise funds for the RF-Lambda Memorial Scholarship in honor of Lieutenant Colonel Mario “Sugar Bear” Carazo. Come meet us at DStreet Bar and Grill (485 S Coast HWY 101, Encinitas, CA 92024) Sunday, June 4th at 1:00 PM followed by more fun at 1st Street and Lumberyard Tavern. We are thrilled to announce Sugar Bear’s Barbeque & Beers to support Angels of America’s Fallen (waiting list) Sunday, January 29, 2017, At Kansas City Barbeque from 12:00 -4:00 PM. We hope you can Join Us! Please help us raise funds for the MCSF Heroes Tribute Scholarship Program. The Heroes Tribute Program provides special funding for the children of wounded and fallen Marines and Navy Corpsmen. Donations will go towards ensuring the children of these heroes are able to attend college.